As for traces of the British presence in Ghanaian architecture and housing they all can be traced back to the colonial history of the country, and although they can be observed both in rural and urban areas, yet those influences and their accumulation differ in terms of territories they were wielded on (Cardinall 2003:75). Architectural and street planning influences affected mostly the southern and central parts of Ghana. Territories which once constituted the Gold Coast colony thus were subject to their regulations concerning every aspect of colonial reality. The manner of street and building designing fell under that category (Curtin 1995:668). Since the major towns of the region were the ones where the British chose to settle, those areas became the focus of their greatest architectural attention and land development activity (Reynolds 1974:57). 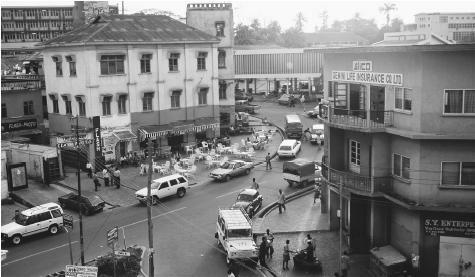 The former capital of the colony, Cape Coast and then Accra, originally small fishing villages experienced transformation into towns, and with time, to splendid urban centers. Characteristic of that transformation was the emergence and rapid growth of a number of pretentious whitewashed houses and tenement buildings, architectural novelties in the area, where for centuries mud and brick were dominant in the architectural landscape of human settlements. Upon regulations enforced by the colonial jurisdiction a great number of roads were broadened, covered with asphalt, and at their edges paved spaces created. To facilitate both commuting and communication, railway tracks were laid and motorways constructed connecting major towns. By 1923 the existing railways at New Tafo and Kumase were linked, mainly the cocoa and timber production in the Eastern Region and Asante, and before the end of 1927, another important rail route, the Central Province Railway from Huni-Valley on the Sekondi-Kumase line to Kade was nearly completed. This new railway line helped to tap the rich resources of cocoa, timber and diamonds found in the Central and parts of the Eastern Regions (Wraith 1973:224). Finally, plans for extension of the railways further north of Kumase to northern Ghana were laid out (Wraith 1973:225). Also for the purpose of Gold Coast-England connection, in 1928 a deep-water harbour at Takoradi was constructed (Meredith 1974:58) and building another one at Tema, a sister city of Accra was launched. 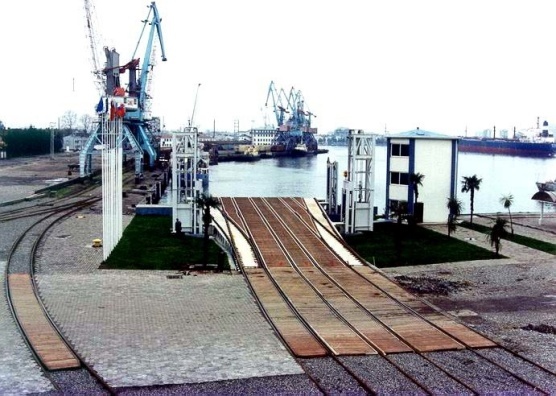 Although the construction of the harbour at Tema began five years after Ghana attained independence from the British, the construction of the harbour still remained to be supported by the British financial resources (Reynolds 1974:57-59). 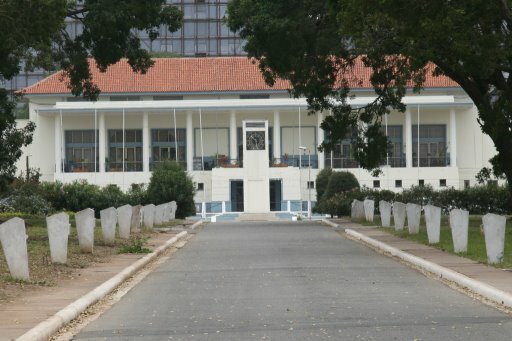 Apart from establishing an European order and design of land, the British authorities considered it as extremely important to “civilize” their subjects in terms of admiration of the art of architecture, therefore buildings of administrative and military institutions such as the Customs House, Parliament Building and General Post Office in Accra were erected in a Renaissance style (Elleh 1997:23). Quite an opposite situation was experienced by rural areas at that time due to their secondary importance for the development of the colony. Because of the high level of illiteracy of their residents and the lack of educational prospects their population was unattractive for prospective British employers, and the areas alone had nothing to offer but the unfavourable climate and tropical diseases. All those factors determined British decisions regarding their land development activity and their choice of coastal towns as the center of their attention. However, one should not expect that the lack of interest in developing the rural areas of the Gold Coast prevented coastal villages and hamlets from imposition of British regulations regarding housing and land development-they were simply less noticeable and of less importance when compared to those concerning urban areas. Therefore, order of widening the numerous paths that wove through almost every village was pronounced. Moreover, every house-owner was required to keep his domicile clear of litter on pain of punishment; it was hoped that the introduction of health policy would improve the well-being of the rural population by increasing their awareness of the role of hygiene in everyday existence (Greene 2002:62). Socio-economic aspect and its effects on the functioning of urban population . The evolution of small towns into splendid urban centres involved not only the advance of architectural and land development techniques, but also gave birth to occupations previously unknown to the native population of the Gold Coast. Representatives of mining, carpentry, engineering industries emerged in response to the emergence of new industrial branches, the phenomenon which was determined by the exploitation character of the colonial policy on the Gold Coast. 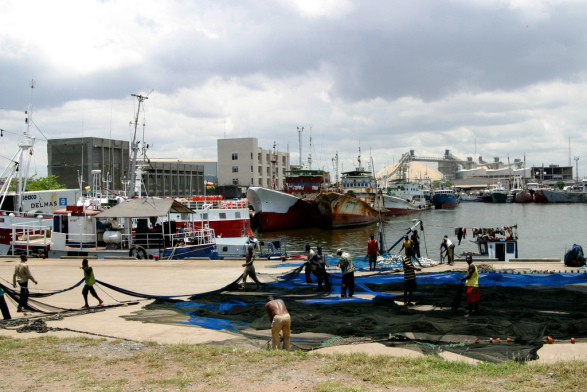 Since towns like Cape Coast, Accra or Takoradi dealt with an export of Ghanaian goods and natural resources such as cocoa and gold to the European market, their plants, shipyards, railways and mines became a place of employment for qualified Ghanaians. Members of the Ghanaian educated elite found also employment in civil service and central government (Kropp :1997:13). Adoption of the conventions and rules governing the urban model of life and holding a respectable office required also adoption of the British manner of clothing, speech and pace of life. Thus, the majority of native residents rejected Ghanaian traditional clothing, which consisted of wide and usually two-yard-long strap of hand-woven cloth called kente. Whilst women wore it wrapped around the entire either lower or upper body, men utilized this type of cloth as long gowns worn over loose pants, which were also made of local fabric. Standards set by colonial institutions providing employment for the local population forced them to abandon such “uncivilized” attire and adopt the manner of clothing of their British employers. Therefore, it became common to see native residents of the Gold Coast dressed in cotton suits, corsets, shirts or dresses. The wearing of Western dress was not only a requirement, but also a cause of changing the way Africans perceived their own traditional values concerning dress. Sometimes the change took on alarming proportions like in the early 1930s, when educated native residents of the urban centres started forming clubs whose members were sworn in to wear only European-style clothing under pain of fine. There were, however, individuals like Ephraim Amu (1898-1995), for whom the imposition of Western fashion was the reason to begin strong appreciation of their traditional way of clothing, and equally strong opposition to the British approach concerning this matter. This Presbyterian minister was Ghanaian by birth who in 1931 appeared at Presbyterian Training College, his place of work wearing Ghanaian traditional clothes and thus lost his employment (Aradeson 1975:24-26). There have been, however, only a few such extreme cases as described above in the history of the country since residents of both newly independent and contemporary Ghana represent an open-minded attitude as far as style of clothing is concerned. Traditional clothes remain popular and appreciated during national holidays and festivals, yet in every-day life they are either replaced by fashionable T-shirts, shorts and dresses, or mixed with them, hence it is very common to see men dressed in a Ghanaian shirt with khaki pants, or women whose T-shirt is wrapped by a piece of traditional fabric (Rotberg 1970:19). Requirements for jobs, which arose as a result of the establishment of new industries in the urban centres, included not only the adaptation of the model of clothing represented by the British employers, but also the language they used at work, tongue which, apart from being the official language of the Gold Coast and later Ghana, provided access to education and entertainment offered by the media (Salm 2002:22). Another major change resulting from the encounter of the indigenous population of the Gold Coast with the process of urbanization of their region, and encounter with the British themselves, concerned the size of a typical Ghanaian family, which, when compared with its size from the pre-colonial times, decreased considerably (Caldwell 1968:15). The drop in the number of offspring within a single family unit came as a response to switching the character of the region from agricultural production to both mining and administrative activity, which did not require, compared to farming, a lot of manpower to perform the whole process of cultivation and harvesting. As it left the landscape of a typical village almost untouched, British colonialism caused profound changes in the role of man and woman within rural society and approach of native rural population concerning the notion of land ownership (Oppong 1983:31). Since the majority of male residents of rural areas when moving to urban centres to work in colonial gold mines, (Hill 1963:21) left their households with surrounding farmlands, their responsibilities involving cultivation of the land and harvest were taken over by female members of every individual farm, who already were burdened with running households and taking care of their offspring. In order to reconcile farming duties with family care they made attempts to set new standards governing farm management, which would reduce the amount of time devoted to cultivation of the land. Therefore, plants previously tended by men were eliminated from the process of cultivation and replaced by crops, which did not require too much tending and at the same time were the source of calories and nutrients. As an example of a cultivated plant introduced only in the colonial period, A. Whitehead (1990;425) gives kasawa, a crop with an edible tube, a plant extremely popular among families left without their male members for two reasons. First, the cultivation of the plant required single cleaning of land it was supposed to grow on, and secondly, its cultivation did not demand fertile soil (Whitehead 1990:425-430). Apart from the change in the role of women in rural society and changes it brought to daily existence, colonial jurisdiction introduced new regulations governing land ownership. In the pre-colonial period the right to utilization of the land was more important than reclamation itself and belonged to the local chiefs, who were in power of granting the right to cultivate individual pieces of land to anyone as long as it brought improvements to its condition. The notion of selling and buying of land was unknown to Africans. Such an approach towards the matter of land ownership was unacceptable for British colonists, since they believed that every single piece of land must be possessed, even if it is not cultivated. Therefore, lands which were found unadopted were seized by the colonial government and either granted to British settlers or allotted to formation of nature reserves (Stone 1975:1-2).